The recent weather patterns have tested the patience of many observers and astrophotographers in the UK, but on the night of 18 January, it was most definitely our turn for clear skies. I drove to the church car park at Old Hutton at around half past five, to find three colleagues from the Eddington Astronomical Society already there! There were three potential comet targets on my list that evening, resulting in varying levels of success and more lessons learned. The handset of my AZ-EQ6 mount allows pre-programming of GOTO coordinates, so I had already loaded the comets’ coordinates in the warmth and comfort of home. Once the mount was aligned, picking up the pre-programmed targets was very easy. I also took the opportunity of the observing delay (caused by the slight cloud layer during the alignment process) to calibrate the mount’s adjustment knobs. First up, low in the south west, Comet 15P/Finlay which is described in Sky Safari as magnitude +13, but is unexpectedly in “outburst” so significantly brighter. I could see it clearly in the 24mm eyepiece at 33x magnification. In the photo, its outburst form is very clear and really rather pretty. Finlay had to be the first target as it was only 15° above the horizon at dusk, and quickly setting. And finally a wide angle “context” shot through the trusty old 50mm manual lens (which came with my first Nikon, the F301, in about 1987). 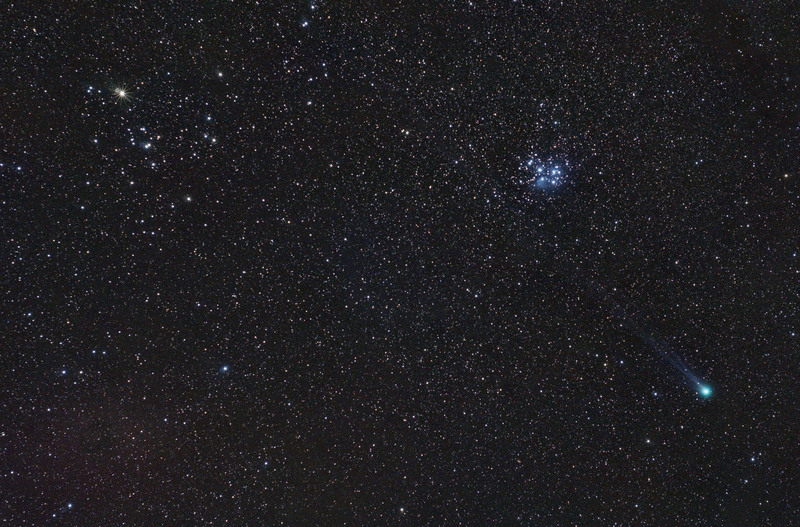 The tail goes on for ever, past The Pleiades and the head of Taurus. All in all, a very satisfying evening. 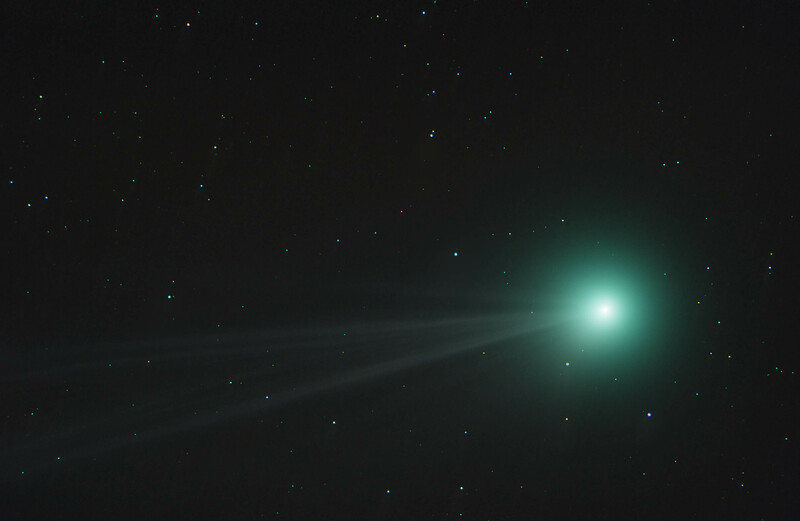 Images have been pouring in from around the world of this most photogenic comet, which is already around 4th magnitude and visible in the night sky of the northern hemisphere. After many frustrating evenings of cloud hopping, or being completely defeated by the inclement weather, or having the comet’s delicate tail features drowned out by a full Moon, our turn came round on Monday the 12th of January. The normal best options of Tebay Road and Shap Summit were forecasting winds gusting to 30 and 40 mph, and looked as though they would be clouded over earlier than more northerly locations. Keswick, in the north of the Lake District, showed great promise on the forecast charts – and there is a beautiful location above the town which is home to the Castlerigg Stone Circle. The forecast here was for gentle breeze and cloudless skies from twilight to about 9pm. After about an hour’s drive it was pedestrian access only, through a narrow gate on a strong spring, so it took several trips from the parked car to set up the tripod, mount, telescope, camera and all the bits and bobs that make up an astrophotography session. 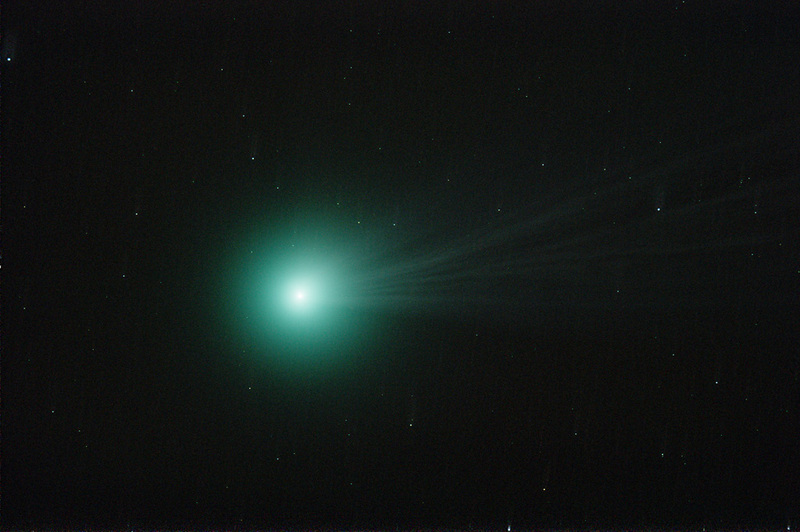 The sky looked clear as the light faded, and Lovejoy was clearly visible to the naked eye before full darkness at 18:36. The new alignment routine for the mount was really straightforward, and the handset reported alignment to within ten arc minutes in altitude and azimuth. That’s enough for the exposure needed, so I hooked up the camera and started. 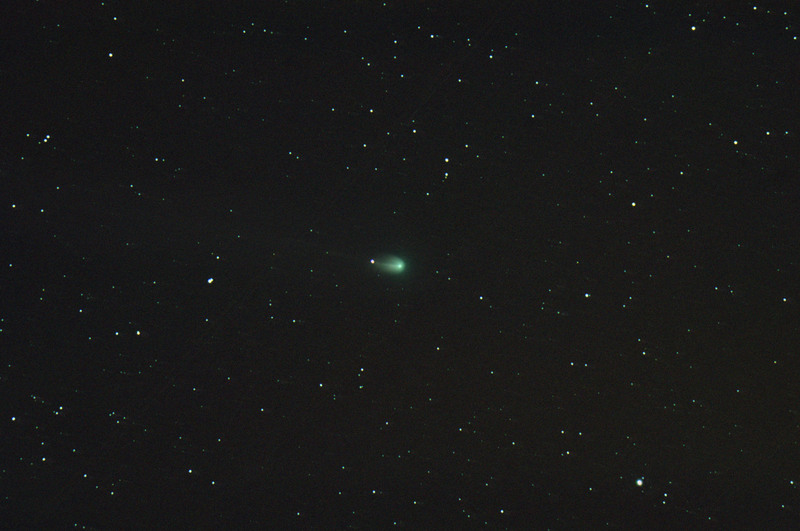 First off, a series of frames through the 300mm lens, which stacked nicely to reveal some good detail in the comet’s tail. Nikkor 300mm f/5.6, ISO 800, 22 minutes. 22 frames of 1 minute. To be really critical, there are some major defects in this photo. The ambient light from the nearby town caught the humidity in the air and presented a layer of faint light – invisible to the eye – that blurred in the wind across the long exposures. It can be seen as a scratchy effect right across this photo. 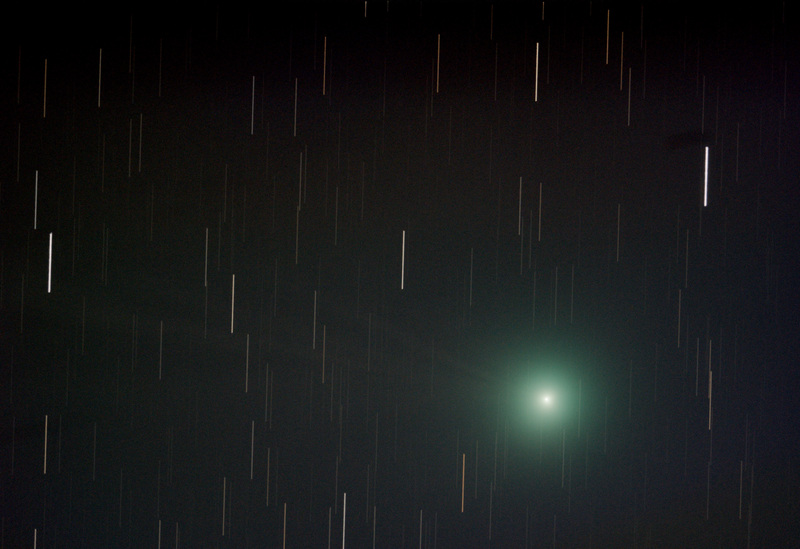 I last saw this phenomenon when I took summer photos of Comet C/2011 L4 (PANSTARRS) passing Yildun from my back yard in June 2013. At the time I thought this might be a combination of light, moisture and wind, and now I’m sure of it. 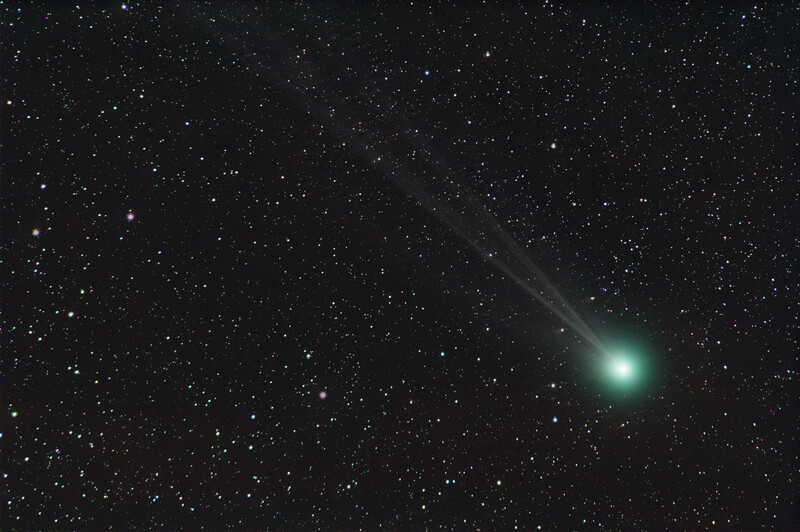 This defect also made replacement of the stars – eliminated by the comet processing – less satisfactory. By the time I have collected enough of these frames the clouds are creeping in, so I switch to using the Nikon straight through the telescope, effectively an 805mm lens. Some of the effect of the ambient light is eliminated by this move, but the result is still less than totally satisfying. Several of the frames had to be discarded as they were degraded by cloud interference. Altair Wave 115/805 f/7, ISO 800, 16 minutes. 16 frames of 1 minute. It is interesting to think that a couple of years ago, I would have been blown away by the thought that I could take photos like these. Now, with greater experience and understanding of the techniques, I cannot help but see the imperfections. That falls somewhere between a disappointment and a really exciting challenge! Following the amazing performance of the refreshed AZ-EQ6 mount a few nights back, I started to wonder what the theoretical limits of polar alignment might be, given the practicalities of turning the mount’s adjustment knobs in the field. 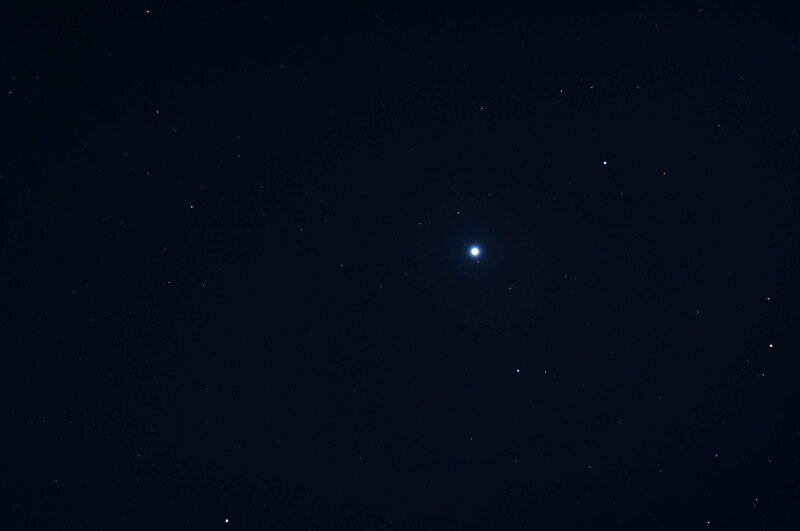 I had managed a six-minute shot of Vega – see my last post – with no trailing, and no external guiding. That’s just the mount doing what it’s supposed to do, and doing it rather well. All other things being equal – and with the caveat that in the real world this is never the case – we can consider that there are two variables in the system: the inaccuracy of the polar alignment and the length of the exposure. 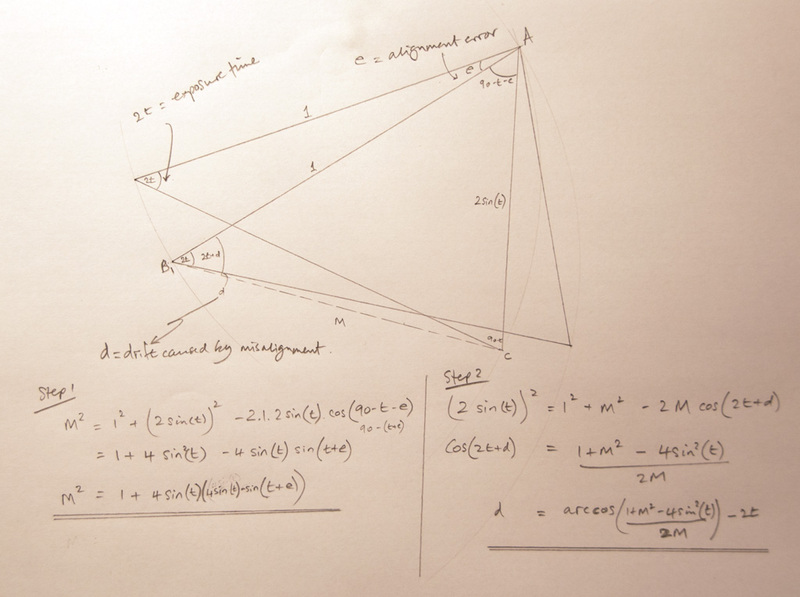 The more the error in aligning the mount, the greater the difference between the axis of rotation of the camera and the axis of rotation of the Earth. 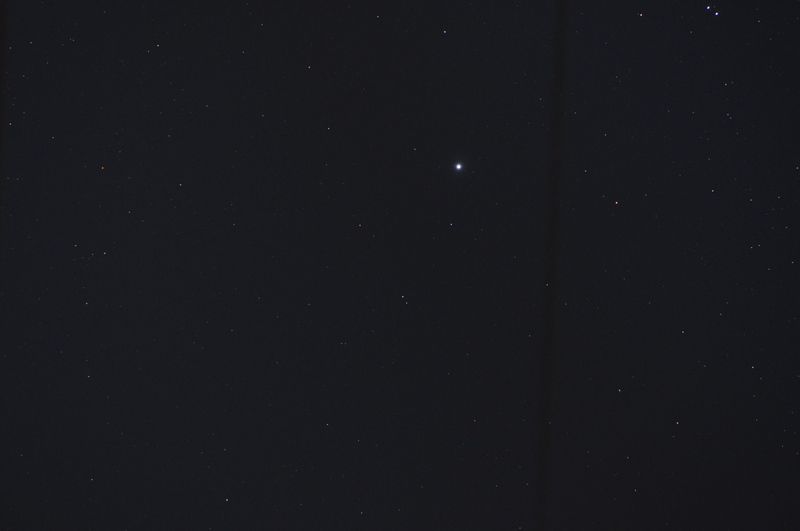 This difference will show as trailed stars, and the length of the trail will increase with the duration of the exposure. Given my setup of the Nikon D90 on the Altair Wave 115/805, the sensor resolves the image to 1.41 arc seconds per pixel. My calculations* are very encouraging, as they suggest that if the mount is aligned to within a very achievable half a degree of the celestial pole, the drift will not show as a complete pixel for 10 minutes. 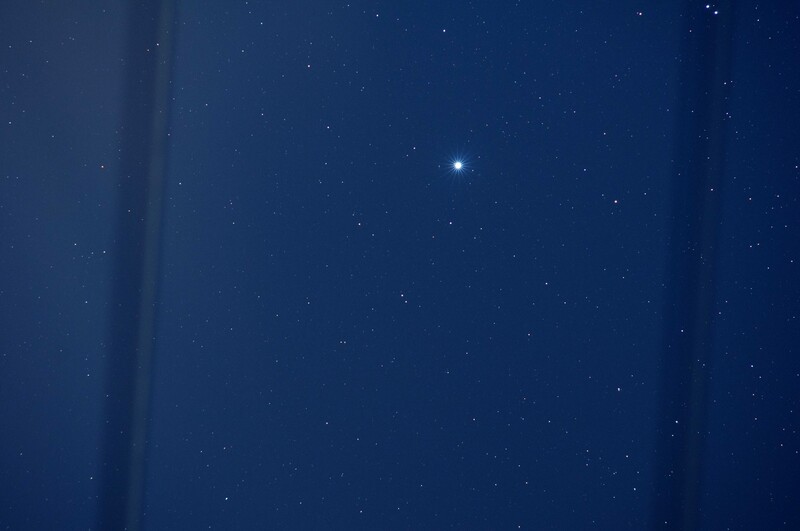 Even an exposure of 4 minutes will only drift a tenth of a pixel. More practice, experimentation and experience will show just how far the real world parameters are from this ideal. *Many thanks to Abhijit Pendse for his most generous assistance and guidance on the maths of this problem, through the Facebook page for Astrophotography/ Amateur Astronomy Enthusiasts. I’ve been having a really troubling time with my new AZ-EQ6 equatorial mount. I say new, but I bought it about a year ago – second hand – and it has puzzled and infuriated me ever since. First up, the previous owner had snipped the power supply cable and wired it to a mains adapter. No problem there, so I undid his modification and wired it back to a “cigar lighter” plug for use with a battery pack. Despite all the care in the world, I somehow got it wired to the wrong polarity and promptly blew the mother board as soon as I switched it on. Embarrassing. Took it to the “repair and service division” of one of the UK’s best known retailers, who smiled sympathetically, wagged a finger, tut-tutted and said they would check it out. Days turned into weeks, weeks turned into months, gentle reminders turned into an increasingly despairing string of phone calls and emails, and eventually they returned it, fixed. Their apology for the shameful delay was not to charge me. Fair enough. We have since made up – you can’t stay angry all your life now, can you? 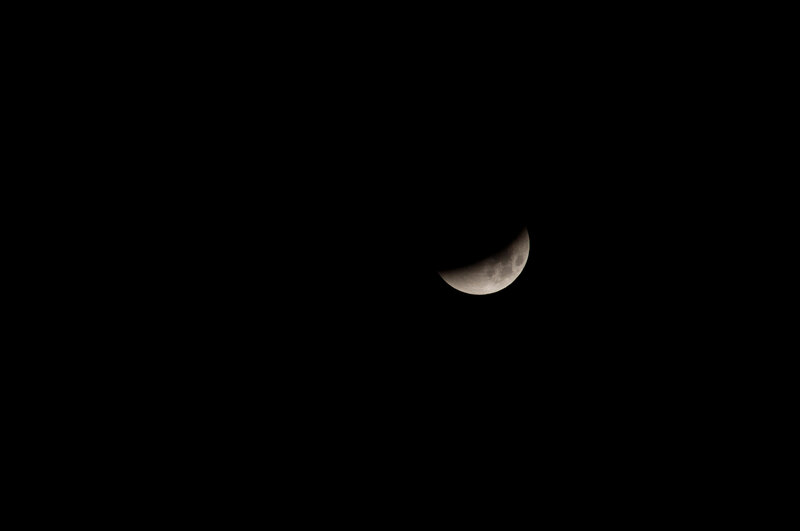 300mm f/5.6, ISO 800, 8 min. The AZ-EQ6 is a heavy beast, and I use it out of the back of the car. Incidentally, it lives in my basement, so each astro-session starts with lugging the boxes up the stairs and out the front door to the car. Practice makes perfect, however, and I can set it up in the dark in about five minutes, then run through the alignment routine and we’re good to go. Except we weren’t good to go. It just didn’t work very well. The “advanced polar alignment” routine, using feedback from the star-aligned telescope to adjust the polar alignment of the mount, kept producing crazy results. Crazy adjustments, endless frustrations. I resorted to drift alignment, convinced that I must be getting something wrong but baffled as to what that might be. Then we hit rock bottom. Drift aligning produced near-perfect levels of polar alignment, but the stars still trailed for anything over 60 seconds of exposure, even at a relatively modest 300mm focal length telephoto lens. After several sessions it occurred to me that the drift was entirely in RA, and the mount drive was therefore running slightly fast. There was no drift at all in Dec. I sent an email to SkyWatcher to ask them how to fix it. The moment I sent that email, it came to my attention that there were a couple of “firmware updates” on the Skywatcher website: one firmware update for the motor drives, one for the handset. The list of “fixes” for these updates read like a copy of my list of queries. Maybe, just maybe, I wasn’t doing anything wrong at all. Could it really be that the mount was inherently faulty? That looks good, but it’s not the position of Vega that caught my eye, as that’s impossible to tell without layering the frames together. It’s the stars at the edge of the frame. I had become so accustomed to seeing them drift off between frames. The image is poor quality because the clouds kept coming and going, but the important thing is that it appears not to be drifting. 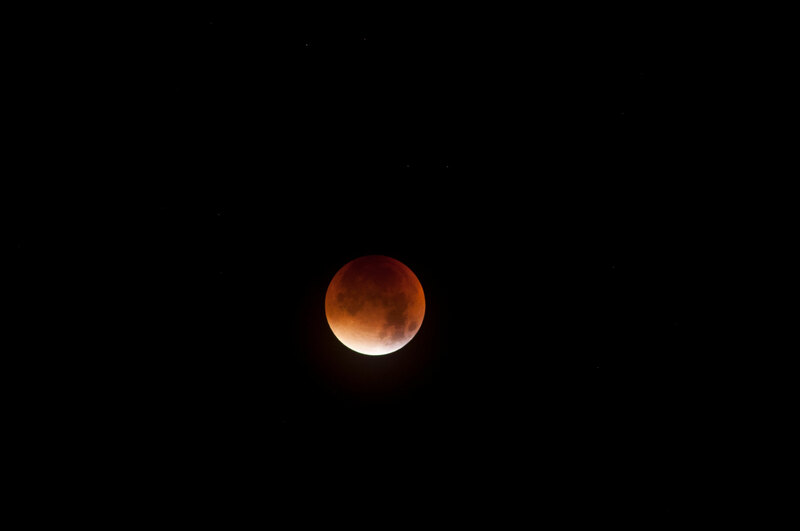 On the other hand, I could do that with the old EQ3: the AZ-EQ6 was supposed to do better than this. A bit fuzzy from the cloud, but it looks pretty solid to me. That’s six minutes, unguided. Happy days. That’s what I believed I had bought in the AZ-EQ6, but had begun to think I’d made a mistake. Next clear sky, I’ll see how far it can go! Not sure if this constitutes a win or a loss, on balance. It was a rare clear night on Saturday, after the weather system of the last week had passed, and it left in its wake a crystal clear arctic air mass with low humidity – low for Cumbria, that is, of which more later. 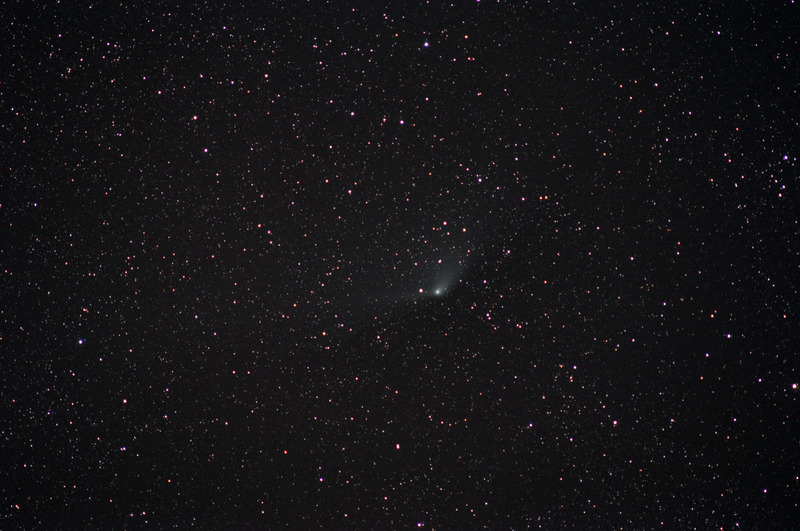 I took the gear up to the Shap Road lay-by and set about capturing comet C/2014 Q2 (Lovejoy). Once the mount was aligned, I dialled in the location of the comet, listened to the wheels and belts of the mount humming away and heard the handset beep to indicate the comet was in the viewfinder. 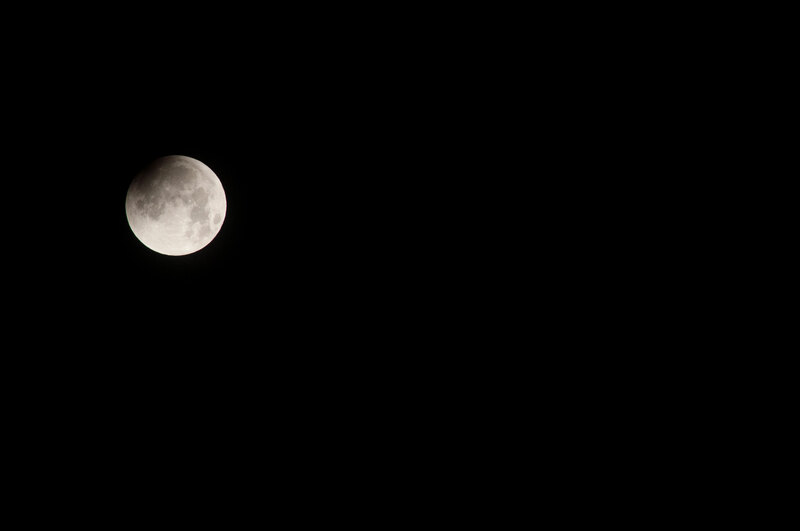 The 300mm lens was already attached to the telescope so I took a sequence of shots using this setup first. 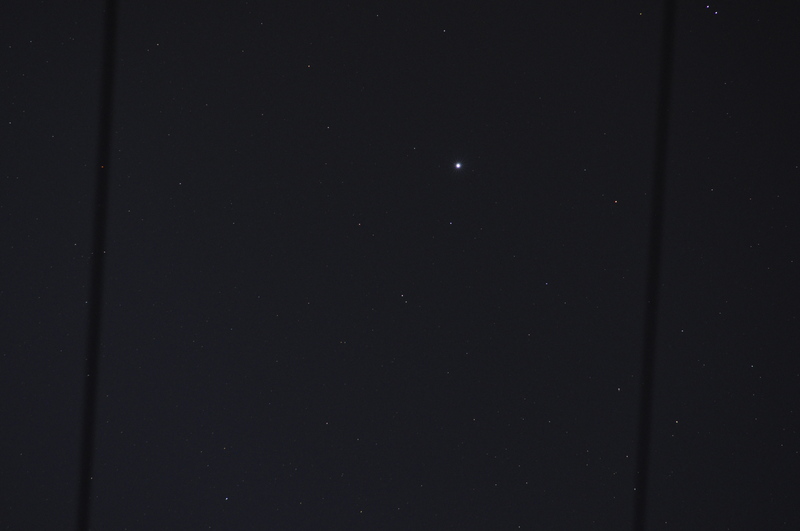 The light level of the full Moon was ridiculous, and Lovejoy was only 30º from the Moon. No trouble seeing the comet, of course, but I know there is a subtle tail streaking across the field of view and I wanted to catch it. Stacking and processing was immensely trying. The tail is there, but it is so completely lost in the moonlight scattering off the moisture in the air that it is an impossible task to isolate it. The more I stretch the processing of these images, the more frustrating it becomes. Against a dark sky, this would be a stunning shot. In the “low” Cumbrian humidity of around 80%, catching the moonlight and spreading it across the frame, it is a nightmare. 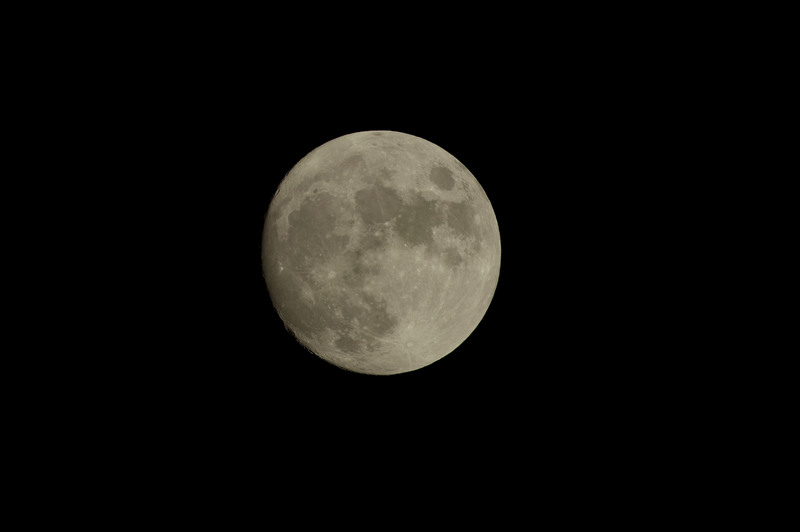 Through the telescope at 805mm focal length, it’s the same story. 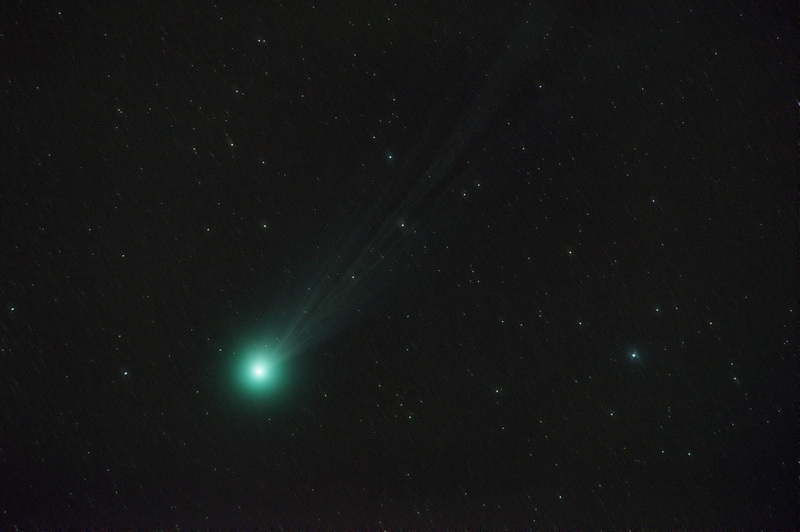 There’s a wonderful hint of comet tails here, but they are drowned in moonlight. Maybe I should have stuck to the “context shot”, the wide angle image that shows the brightness of the sky and the fuzzy blob of the comet. Oh well, we get what we get, and live to get some more next time. For those that like the Moon (and yes that includes me!) here it is from that night. I’ve toned it down a little, to show some surface detail and the tiny crescent of shadow on the edge that indicates it’s not quite full. 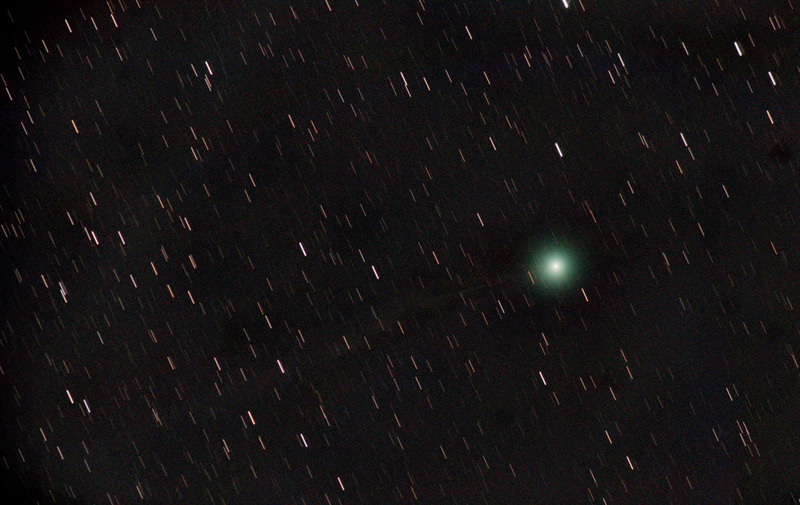 Once it’s safely out of the way in about a week, I’ll be back for more comet action.